WOW! It's hot outside! Perfect time for a no-cook, refreshing, yet filling salad! The classic Caprese salad is easy, fresh, full of flavour, and really filling! Slice your tomato in 8 slices. Slice your mozzarella into 8 slices. 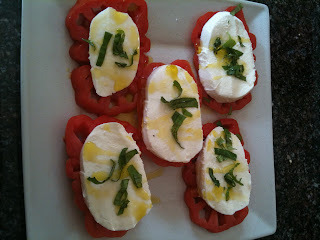 Place your tomato slices on a large plate and top each slice with a slice of mozzarella. Sprinkle with salt and pepper. Sprinkle with the zest of half lemon and then the juice. Top with the basil and then a splash of olive oil. Serve cold. Just as a side note - you can top this salad with grilled chicken or canned tuna for a satisfying, no cook meal!